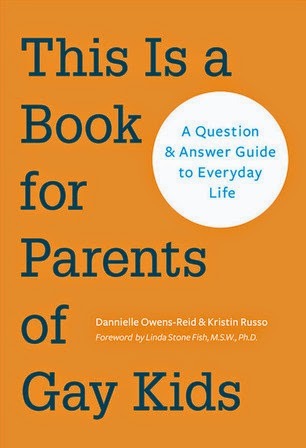 Synopsis: Written in an accessible Q&A format, here, finally, is the go-to resource for parents hoping to understand and communicate with their gay child. Through their LGBTQ-oriented site, the authors are uniquely experienced to answer parents' many questions and share insight and guidance on both emotional and practical topics. Filled with real-life experiences from gay kids and parents, this is the book gay kids want their parents to read. Review:This is a great book to help parents of lgbt kids and also for lgbt kids or adults to read. While the questions are directed to parents the answers may help lgbt youth feel better about the reactions they may receive or questions that people ask. This is all new to many people and while it may have taken a long time to come to the conclusion that you needed to come out as lgbt you need to give others the space to ask questions and come to terms with it as well. Sometimes what sounds like a negative question is just that a question with no malice attached to it more of a information gathering to help the other person process the information. Each chapter focuses on different aspect of coming out and at the end of each chapter there is a short summary of what was talked about. There are real life stories and scenarios scattered throughout the book that also help make this book more accessible and not just feel like a textbook.